Ubiquitous and delicious, Top Pot Doughnuts are an iconic Seattle treat. We visited the Wedgwood location with its huge donut sculpture and comfy library dining area (there’s also nice outdoor seating under the shade of a surprising palm tree). 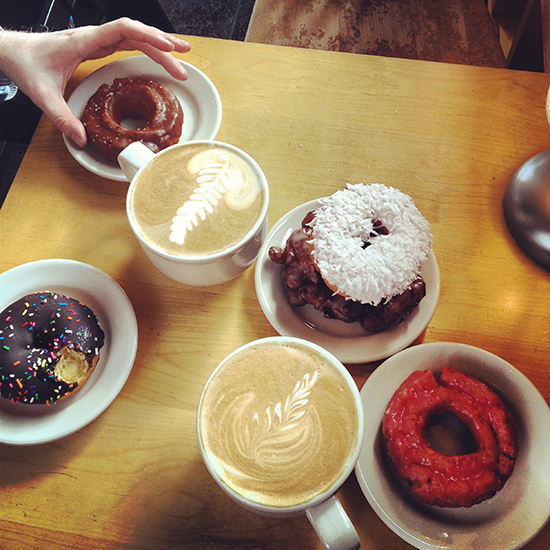 Cute decor is great, but a sweet donut and good latte makes this place a must visit. I indulged in a raspberry glaze and stole bites from a giant apple fritter. Lucky for us, but maybe not our health, Top Pot is available even closer at the local grocery store and there are several cafes scattered across the city. All written content on Brix Picks, unless otherwise specified, is the copyrighted material of Brittany Hague, 2005 to 2019. If you have a problem with anything you see or hear on the site, please contact me at brixpicks at gmail dot com.